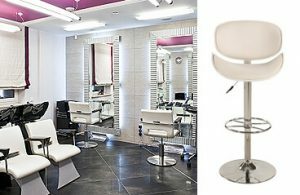 Enhance the look and feel of your salon with Chintaly Imports’ line of contemporary chrome swivel barstools. Choose from a wide variety of styles that will compliment any color palette while taking your salon from ordinary to chic and modern. These five present just a small fraction of the choices available from Chintaly Imports, a full-range supplier of high-styled contemporary and traditionally-styled items. Red could be just the color you need to introduce a bit of flare to your salon! The short back on this swivel barstool just adds to the stylish yet ultra-comfortable barstool. Go salon contemporary with this barstool that will enhance any space, complete with a foot rest your clients will appreciate! The clean lines and black color allow it to mesh with your existing decor. The traditional yet unique design of the chrome swivel barstool to the left is a stylish way to update any salon. The gray presents a neutral tone for a variety of decor and paint color options. The footrest and high back of this barstool lends to added comfort while bringing style and class to your salon. Easily combine wall sculptures and color options with this black and chrome barstool. Be the salon known for the white barstools! Unique for the industry, this Chintaly Imports chrome swivel barstool is oversized for ultra comfort. Use accessories as your pops of color to create a magazine worthy look in your salon.